Without a coherent understanding of the problems confronting U.S. manufacturing, Muro and Andes end up throwing darts at the problem, and it’s not surprising to find that their solutions are self-serving. They argue that the solution to our manufacturing problems is to invest more in R&D, training and “strong regional manufacturing ecosystems.” Such programs could be effective in modestly boosting productivity growth in manufacturing, but only in the context of strong and growing demand for U.S. manufactured products. In a world of inadequate demand, these policy prescriptions are just another form of “pushing on a string,” a well-known problem in monetary policy, but equally apt when it comes to manufacturing policy development. China has been beggaring its neighbors and stealing aggregate demand for manufactured products from its trading partners for more than a decade. In the past 15 months alone, China has invested more than $600 billion in buying foreign exchange reserves in order to depress the value of its currency and artificially boost the competitiveness of its products. It acts like a subsidy to all of China’s exports, and a tax on U.S. exports to China, and to every country where we compete with China. $600 billion is a lot of money, and an analysis that simply ignores this huge development in the global economy and argues for “strong [intra-U.S.] regional manufacturing ecosystems” is far too narrow. The United States is the top target market for China’s currency-subsidized, artificially cheapened exports. I have estimated that eliminating currency manipulation by China and about 20 other countries (most in Asia) could reduce the U.S. trade deficit by $200 to $500 billion per year, creating 2.3 million to 5.8 million U.S. jobs. About 40 percent of the jobs gained (891,500 to 2.4 million jobs) would be in manufacturing—no other single trade, financial, or macro-economic policy could have a larger, more beneficial impact on manufacturing output or employment. There are at least four core problems with value-added trade statistics, as I explained in a recent EPI report. First, the value-added trade framework, which was originally developed by the OECD and the World Trade Organization, fails to account for rapid technological change and the fact that China is moving rapidly up the value chain and increasing the domestic content of its exports. The methods proposed for estimating value-added trade rely on old, fixed co-efficient models to estimate the Chinese content of its exports, which fail to reflect the dynamic nature of China’s economy. Thus, the proposed measures underestimate the domestic value-added in China’s exports. 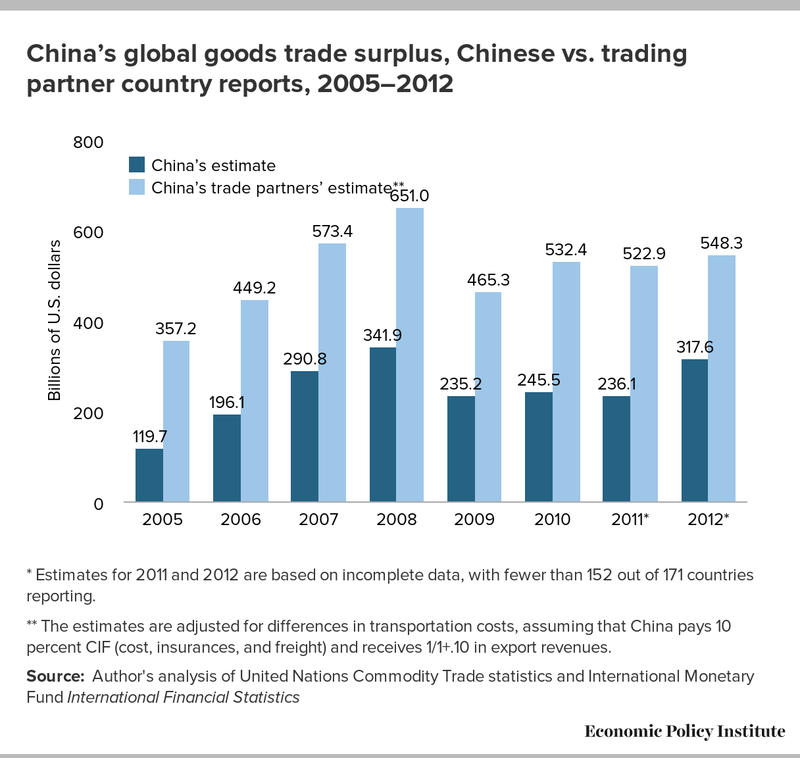 Second, China also cooks the books on its trade statistics. China under-reports its exports and over-reports its imports, creating a distorted picture of its overall trade, as shown in the figure below (from our recent report, Stop Currency Manipulation and Create Millions of Jobs). Value-added trade estimates begin by attempting to reconcile U.S., Chinese, and other trade statistics, giving equal weight to China’s fudged trade data. This artificially reduces the value of the U.S. gross trade deficit with China, even before value-added adjustments are applied. It’s a classic statistical mistake, a transparent case of garbage in, garbage out. * Estimates for 2011 and 2012 are based on incomplete data, with fewer than 152 out of 171 countries reporting. ** The estimates are adjusted for differences in transportation costs, assuming that China pays 10 percent CIF (cost, insurances, and freight) and receives 1/1+.10 in export revenues. Third, value-added trade estimates fail to adequately account for the Chinese share of goods coming into the United States from other countries. China became the world’s largest exporter in 2006, and roughly half of its exports are intermediate products and transshipped goods. A balanced effort to assess the total impact of Chinese trade must estimate both direct and indirect imports from China, and the OECD and other value-added trade estimates completely miss the mark on this side of the equation. Finally, aside from these methodological problems, at the end of the day, value-added and ‘conventional’ measures of trade flows don’t change aggregate trade deficit numbers for any country. The OECD measures largely redistribute trade imbalances from China (though it’s still the largest) to a bunch of other Asian economies that are also currency managers—and they are mostly currency managers because they have to be to match China’s competitiveness. Thus, China and its currency manipulation are still central forces in explaining the growth of U.S. manufacturing trade deficits. Muro and Andes conclude their series by looking at the alleged Chinese content of the iPhone 3GS, with reference to one case study by Yuquing Xing, which claims that only 3.6% of the phones value is attributable to China. This study has achieved the status of urban myth and is widely cited by many other authors. However, the original source data is incredibly flimsy. Charles McMillion noted in “Manufacturing & Technology News” (18(6), October 21, 2011) that it is based on a “teardown analysis” by a trade publication. This “analysis” simply lists the home country of the transnational corporation that owns each of the major components in the iPhone, and its cost. The article “makes no comment about the extent to which any or all of the components are produced in China, in their ‘home’ country or in some third country.” Xing assumes that every component is manufactured in the home country of its parent transnational. It seems odd that Mura and Andres enthusiastically embrace this assumption given their breathless talk about the “rapid globalization of manufacturing value-chains”—such globalization of value-chains argues precisely that even the same firm could well have significant production facilities outside its home country. McMillion notes that the original Xing working paper included no interviews or other evidence on the source patterns of any of the components listed in their study. He also points out that all of the multinationals listed by Rassweller have “a major and fast growing engineering, research, testing and production presence in China.” And because each generation of the iPhone has been assembled in China by Foxconn, there are strong incentives for “all its component makers to produce there.” In addition, China has used its indigenous innovation policies to encourage technology transfer and the development of a home-grown supplier base in high tech industries. The regional manufacturing initiatives endorsed by Muro and Andes, such as the president’s National Network for Manufacturing Innovation, make for great photo ops but they are no substitute for a coherent national manufacturing strategy based on a sound plan to stimulate demand for U.S. manufactured products. And they cannot compete with a Chinese government that is willing and able to invest $500 billion per year or more in manipulating its currency, providing a massive economy-wide subsidy to all of China’s exports and tax on its imports. When problems have global sources, they often require global solutions, and trying to convince people otherwise is not useful.